Linden Lark is a local white man who rapes Geraldine at the book's beginning. Linden, who is the son of Grace and George Lark and is Linda Lark's twin biological brother, is a disturbed and bigoted man. He enjoys verbally abusing people, including Linda, and then mockingly apologizing for it. Linden, suffers from drug and alcohol problems, and received a kidney from Linda several years before the novel starts. Linden rapes Geraldine after he discovers that Geraldine is trying to help Mayla enroll her child in the Chippewa tribe. Linden, who says that he is in love with Mayla, is distraught that she had a child with someone else, and he also seems to intend to steal the money that the baby’s father, South Dakota governor Curtis Yeltow, gives her. Linden kills Mayla and hides her body in the construction site near the reservation. Because of his crimes, Linden meets the qualification of a wiindigoo (a human that feeds on other human flesh), meaning that Joe acts according to tribal justice when he kills Linden towards the book’s end. Now you listen to me, Joe. You will not badger me or harass me. You will leave me to think the way I want to think, here. I have to heal any way I can. You will stop asking questions and you will not give me any worry. You will not go after him. You will not terrify me, Joe. I’ve had enough fear for my whole life. You will not add to my fear. You will not add to my sorrows. You will not be part of this… All of this… It is all a violation. The welfare stole me from Betty and I was alone in the whiteness. You don’t swear on the job, said Sonja. You’re representing something. We drove for a few miles. I asked what I was representing. Reservation-based free market enterprise. People are watching us. White people. I mean, resentful ones. You know? Like those Larks who owned Vinland. He's been here, but he’s nice to me. Like, he's not so bad. The timeline below shows where the character Linden Lark appears in The Round House. The colored dots and icons indicate which themes are associated with that appearance. Churchill, Katherine. 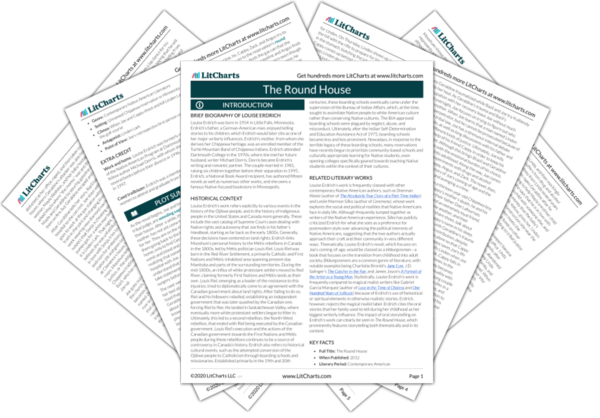 "The Round House Characters: Linden Lark." LitCharts. LitCharts LLC, 28 Sep 2017. Web. 19 Apr 2019. Churchill, Katherine. "The Round House Characters: Linden Lark." LitCharts LLC, September 28, 2017. 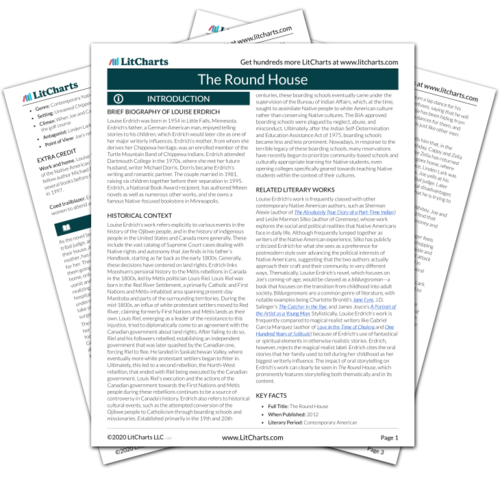 Retrieved April 19, 2019. https://www.litcharts.com/lit/the-round-house/characters/linden-lark.